Well, that was a close call! For the first time ever on No Croutons Required, we nearly had three winners, but at the last moment another vote came in. 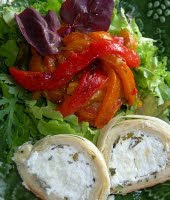 So now, I would like to announce the winner of this month's challenge as Dee from Ammalu's Kitchen with her beautifully presented and photographed Sweet Pepper, Feta and Veggie Salad. A worthy winner indeed, especially because she added some gorgeous feta to her salad. However, I don't think it would be fair to end this post without a congratulations to the two dishes that came so close. Congratulations you guys, your entries were awesome! For next month's No Croutons Required, head over to Lisa's Kitchen. Lisa will announce the challenge at the start of September. Thanks to all those who voted.. this was unexpected ! The winning salad looks fantastic, so colourful! Well done to Dee and her winning dish. And Thank you Jacqueline for hosting again. Hi Rose, it really does look good! I'm glad you posted the near-winners - I'm loving the sound of that coconut rice, and want to give it a try asap! Hi Jacqueline, all delicious stuff! Congrats to the winner. Hi Spaghetti, I liked the sound of that one myself. It has never been so close before Ricki. Well, it was a Very Difficult choice to make this month, I must say. Lots of bookmarking going on down here!